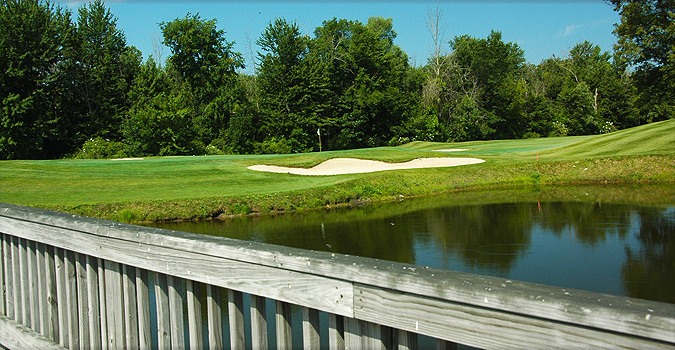 Glendarin Hills Golf Club in Angola (about 2 hours and 15 minutes from Detroit) is a world class golf facility that boasts some of the best conditioning, terrain and amenities available in Indiana golf. Resting on 262 acres of rolling topography (of the 500 owned by the property), the course features a distinctive layout that includes both open links and traditional tree lined holes. 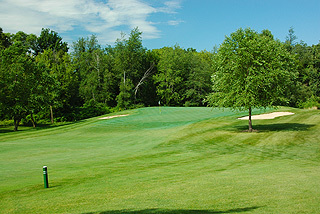 Throughout, golfers will find outstanding landscaping and interesting hole designs. Large undulating putting surfaces that often slope from back to front, soft sand (non-penal) low-lipped bunkers, and challenging green complexes with mounds and surrounding collection areas provide challenge and beauty. There are also some gorgeous water holes, as evidenced from the photos in this review. The views from the upscale clubhouse and patio are outstanding. This modern facility is a work in progress, with room to grow and expand to meet the needs of members and visiting guests. Currently there is a spacious pro shop, small changing rooms for men and women plus Caruso's at Glendarin - a restaurant/lounge open for lunch daily, Friday dinners and weekend breakfasts in season. The flexible banquet/meeting space can accommodate up to 300 people, and features a state of the art sound system, and is a beautiful space for weddings and special events. 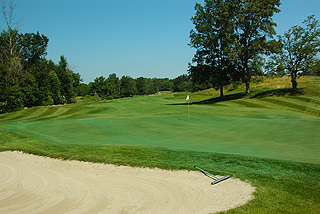 The practice facilities are exceptional (complimentary range balls) with a spacious grass range and huge practice green. A short game area with sand bunker is in the future plans. 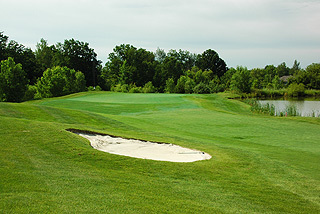 Each cart at Glendarin Hills features a compartmentalized dash and with club partitions in the rear and club weather covers - plus Uplink GPS, which provides accurate measurements from tee to the pin. Soon, golfers will be able to order food for the turn from the carts. On the fairways, sprinkler heads are also measured to the center of the green. 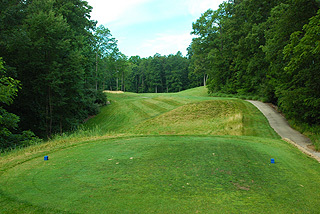 Four sets of tees provide golfers with choices of yardages and slopes playing to 6921 yards/141 slope, 6566 yards/135 slope, 5863 yards/127 slope and 5171 yards/124 slope. As the slope ratings indicate, this can be a challenging round. The terrain is quite rolling and is varied in that many holes are open links style, while some present tight tree lined fairways and elevated green complexes. Golfers with good short game skills will be challenged to use every trick in their bag, from bump and runs to high lobs and pitches. Ponds and wooden bridges add to the aesthetics, but are not simply window dressing. 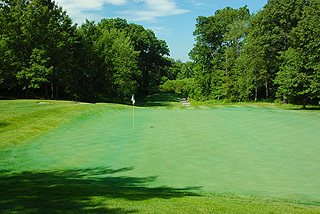 The greenside water hazards on 3 of the first five holes create a need for accurate approaches. Golfers need to pay attention to the GPS on these holes, to ascertain the location of these hazards. 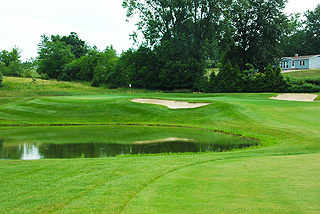 Numbers ten and eleven play parallel with a large pond in between, plus rock lined creeks running along the fairways. On 10 the creek crosses diagonally about 150 yards out. The Twelfth is quite a contrast - an extremely tight driving hole with trees defining the fairway. We cannot offer a high enough recommendation for Glendarin Hills. At $70 including the first class cart and free range balls in 2005, this course is priced higher than many courses in the area - but the fee reflects the fact that this is a first class operation in every aspect. 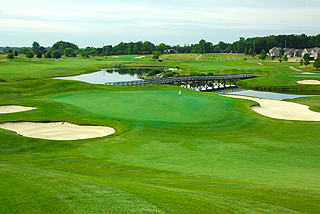 Great service, friendly people - and a wonderful golf experience. 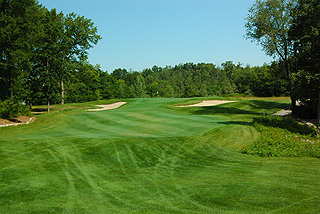 For more info, visit our page for the course, with direct link to the Glendarin Hills website by clicking here.